Vasundhara Raje, the Chief Minister of Rajasthan state. 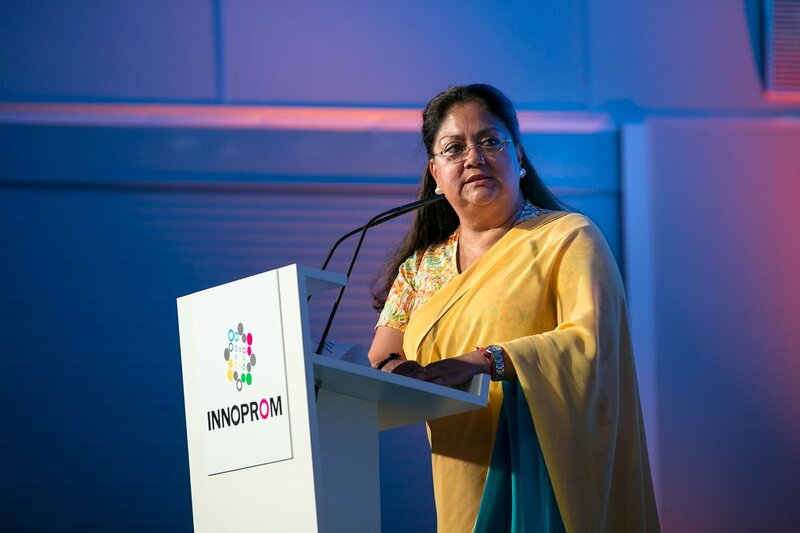 Vasundhara Raje Scindia, Chief Minister of Rajasthan state, told participants at INNOPROM why her staff had came out from the wings onto the world stage, and invited the Ural agrarians to India. “It is important to show Russia how the idea of corporate federalism is implemented in India,” said Vasundhara Raje, the Chief Minister of Rajasthan state, “as it allows the states that were previously not at the forefront to develop, go behind the scenes and show the world what they are capable of”, said Raje in her address to the gathering at Russia’s largest industrial innovation fair. “This is my first visit to Russia,” she said, “but we have known from childhood that Russia has long supported our country. Here we were greeted very warmly. This hospitality has confirmed what we have known for a long time. Our state is known for its natural beauty, and tourism. We are the most advanced country in terms of the railway network and direct access to almost all the regions and many airports in India,” said Raje. “Russia is the largest supplier of defence industry products and Rajasthan is a border state, where we have tested all the purchased weapons. So being familiar with the defence enterprises is very exciting for us,” said Raje. “Also, we are willing to work to develop the knowledge economy: Rajasthan (which means land of kings) is the fourth in the number of state universities in the republic of India. Our policy on start-ups is ready to meet the challenges of tomorrow,” she emphasized. In addition to the common interests in the defence industry and industrial engineering, Raje (who hails from a “royal” family herself) has allocated a forest complex in the state. “I flew on a plane and was thrilled to see an incredible amount of forest land. It would be very interesting to study your experience: how can we keep such a stunning forest in this industrial region, as the Sverdlovsk region?” she asked. “We also encourage sustainable forest management. I think that in this area the Urals and Rajasthan can bring cooperation to a new level”, she said. During the INNOPROM Raje held talks with Denis Pasler, who heads the government of Sverdlovsk. After their meeting, industry ministers of both regions have been tasked to prepare a detailed plan on cooperation in the timber industry and heavy engineering. Raje invited businessmen from Sverdlovsk to an agricultural exhibition, due to be held in India in November 2016, and to the global investors summit in Rajasthan in 2017. “Despite the fact that in five months of 2016, the trade turnover between India and the Sverdlovsk region increased by 40 per cent, I am sure that we do not realize our full potential,” said Pasler. “We have no oil in the Middle Urals, but there are engineering companies which produce equipment and components for the industry: drilling rigs, pipes and more. We are ready to help you create a pool of our industrialists for further work,” said Pasler, responding to Raje’s suggestions on cooperation. Rajasthan is one of the largest states of India with a population of 77 million people. It provides 3.3 percent of India’s GDP. In foreign investment, it ranks third in the country. Cumulative global investment, according to 2015 data, has reached 52 billion dollars. The economy is primarily based on agriculture. The mining industry is in the second place in terms of importance. A third of India's oil production is also concentrated in Rajasthan.